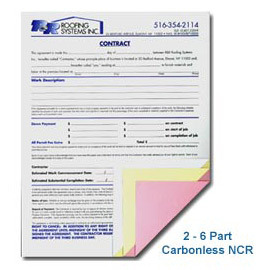 We produce various types of custom carbonless NCR forms for your business, such as data forms, invoices, and contracts. Available in 2 through 6 part multicolored NCR using a wide selection of finishing options. We offer edge glued, , snap sets and manifold books and also provide numbering for reference purposes. Special form printing discounts are available for clients who require custom printed forms on a scheduled basis. 1. Select options for your NCR form. 2. Add ncr form to your list.